*Editor’s Note: Mark Dizon is an International Rowing Umpire licensed by FISA. He is a Director of the New Zealand Philippines Business Council and is the Managing Director of MDG Property Management Ltd. (www.mdgproperties.co.nz). Food and beverages were showcased in the three-day “Experience New Zealand” Trade Fair held recently at the Glorietta Activity Center, Palm Drive. To officially open the fair, New Zealand trade commissioner Hernando Banal and New Zealand ambassador to the Philippines Reuben Levermore led a ribbon-cutting ceremony on its first day. Ayala Land Corp. chairman Jaime Augusto Zobel de Ayala also joined Levermore for a ceremonial toast later in the evening. You may want to participate in this event on the 24th of May 2013. EPIC NZ 2013 is the leading networking event for New Zealand businesses to connect with ethnic businesses to harness potential trade opportunities.I t is the largest NZ networking conference established by the Department of Internal Affairs & the Ethnic Affairs Committee.This may be an opportunity for you to establishnew networks not only in New Zealand but in Asia as well. Tickets are free, but seats are limited. MANILA, Philippines - A Filipino was named the Best Farm Manager of the Year from Otago during the Dairy Industry Awards last April 6. Neil Molina, a farm manager at Concept Holding in Ranfurly, New Zealand, also received the AgITO Human Resources Management Award. The awards are part of an annual search for farmers across New Zealand and at various levels of the dairy industry who excel. Molina is employed by Greg and Kelly Kirkwood who have employed 13 Filipinos to take care of 2,300 heads of cattle. ... Today with 1130MW of installed capacity, EDC ENERGIZES 1 out of every 10 light bulbs in the Philippines. 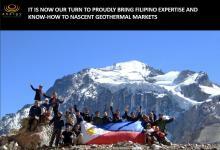 We are THE LARGEST vertically integrated geothermal company in the world at the cusp of going global. We will WORK VERY HARD to bring the CLEANEST and MOST RELIABLE baseload energy to the world leveraging the best the Philippines has to offer – FILIPINO talent, FILIPINO experience and FILIPINO expertise. NZPBC Membership Discount Sends Shockwaves!!! It's true!!! You get more than what you initially pay for when you join the New Zealand Philippines Business Council (NZPBC). Just recently, a member took advantage of the NZPBC's membership discount benefit with Ideal Electrical (www.ideal.co.nz), a market leader in the New Zealand electrical wholesale sector. Instead of shelling out $350, he only paid $220 for his purchase, giving him a whopping 37% discount!!! This already parallels the rate being offered to one of Ideal Electrical's major electrical contractor clients. Read more about NZPBC Membership Discount Sends Shockwaves!!! Foreign investors are again kicking the tyres of the Philippine economy, and with good reason. During the first half of the year, the economy, one of Asia’s consistent underperformers, expanded by 6.1 per cent from a year earlier. Only China and Indonesia grew faster in Asia. Resilient remittances from the country’s army of workers located across the world from the Middle East to North America have fueled domestic consumption. The Philippine peso reached a four- year high ahead of a central bank meeting tomorrow at which interest rates are forecast to be unchanged after three reductions this year. Bonds weakened. Philippine Stock Exchange Inc. (PSE) Chief Executive Officer Hans Sicat said share sales are poised to surpass the bourse’s full-year target as transactions accelerate toward the end of 2012. Sicat sees three more initial public offerings being completed this year, he said in an interview last week, declining to name the companies. That would take the annual total to six, compared with five listings in 2011. There are enough funds in the stock market to absorb new IPOs or share sales by listed companies, he said. SYDNEY—The government of the Philippines is planning meetings in Australia for the first time as part of a push to widen their investor base and showcase opportunities in the Southeast Asian nation, the head of the Philippine central bank's investor relations office said Friday.